Hayward Martial Arts Classes For Kids & Adults - Fitness Kickboxing - Birthday Parties - Summer Camp & More! In every one of our adult martial arts clases, you'll learn self-defense skills for safety & protection... You'll experience inner-development as you push yourself in training & practice... And you'll have a ton of fun every step of the way. Our kids martial arts program teaches more than just self defense... It teaches focus & concentration, for better grades. Respect, for improved behavior. Fitness, for health & wellness. And of course, every class is a ton of fun. Ready for the funnest, most fat-melting workout of your life? 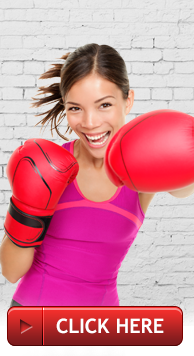 Our fitness kickboxing classes use real gloves, real heavy bags, and proven fat-burning exercises to get you in awesome shape, fast. One of the moat important benefits of our classes is the impact they'll have on your physical health and fitness. Both kids AND adults get great workouts here! But these aren't just any old workouts. They won't just make you stronger. They'll make you more coordinated, more balanced. more flexible, and more energized. This is so important in the modern society we all live in. After all, when do any of us have time to exercise any more? These days, it takes true commitment to reach those fitness goals, and we're here to help you and your children every step of the way. It's hard to do it on your own. It's 100x easier when you have an awesome family like ours on your side. Back in the day, hundreds of years ago, you'd never see "martial arts" and "fun" in the same sentence! Well, a lot has change since then, and most of us are no longer training for battle! We're training to get fit, feel confident, learn self-defense, increase our focus, and... have FUN. That's why every class is a great mix of both hard work and challenging tasks, as well as light-hearted fun that'll have you and your kids smiling and laughing. But don't get me wrong! You'll work hard here - as hard as you're willing to. But it's done in a fun way that makes training enjoyable. After all, the more you enjoy it, the more you'll come to class. And the more you come to class, the more results you get. If you're looking for a workout that's so fun, people literally say it's “addicting”, welcome to our Hayward kickboxing classes.